Can you believe it's New Years Eve? My blog has been through so much this year and I would like to take a moment to look back on the best and worst. But first I would love to share my Holiday's with you. Christmas is a busy time for my family. My daughter's birthday is Christmas Eve, I can't believe she's already seven. It felt like yesterday I held her for the first time. Before I get emotional, I will change the subject ;). This year we decided to add some new traditions into our Holidays. We tried the Christmas Eve Box and can I just say, it went absolutely amazing. I had a feeling Lily, my oldest would stop believing in Santa with school and kid talk, she was on the fence but after attending a cookie swap (Santa surprised them) and the Christmas Eve box I think she still believes. In case you are wondering what a Christmas Eve Box is, it's simple. Pj's, Hot cocoa, a Christmas movie or book and popcorn. 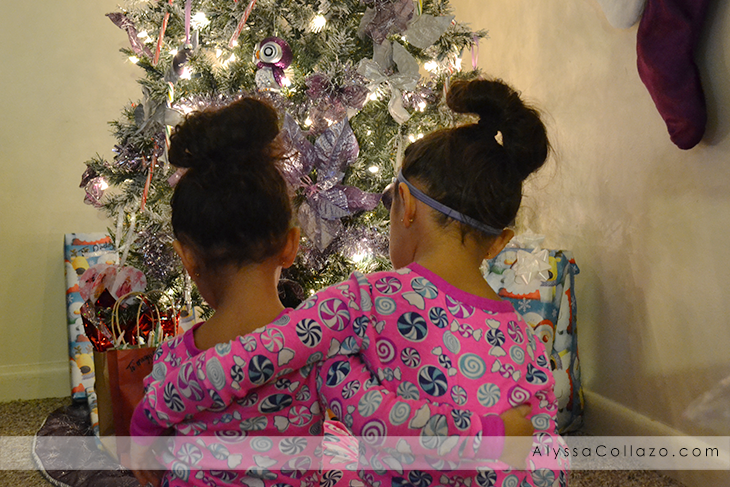 I included a personalized letter from Santa and it sparked their attention. I also did mine in a cute bag from Santa. Right before we left to celebrate my daughters birthday I put the bag in front of the tree and the look on their faces when we came home was priceless. My oldest asked Santa for a vanity. I mean every time we seen Santa it was a Vanity. She would write letters and leave them for Santa. My first instinct was she's too young but after browsing Amazon I figured why not. She's only going to get older. I went with a "mini adult" vanity vs a kid one. Sophia, my youngest asked for the usual.. Barbie dolls but to be specific, thanks to Netflix she wanted a Winx Doll. Not so easy to find but during Black Friday, Toys R Us just so happened to have a shipment come in and guess what. She got the doll haha. "I use to think being a kid on Christmas was the best thing ever but it turns out having kids on Christmas is." So true, right? My girls reactions were priceless. Lily loves her vanity and we surprised Sophia with one too. Now back to New Years. I still can't believe it's the last day of 2014. I usually like to start of with a resolution and this year I want to make my resolution public so you all can help me complete it. My resolution for 2015 is to practice photography. Last year my fiance bought me a DSLR, a Nikon D3100 in red. She's beautiful. I have used her for a few sessions, but mainly use her for pictures of my girls and product reviews. I want to get the best out of my camera. I did a newborn session, engagement, and wedding. I still catch myself browsing pictures because they were all stunning. Now, I just need to make the time to practice a little more. If I had to pick one of my favorite posts this year it would have to be my Chicco Nextfit Review. Why? I was able to share so much about the benefits of ERF (Extended Rear Facing) and so much more. My favorite giveaway would have to be my giveaway that is live. Disney on Ice. Being able to give two families the chance to experience something so magical makes my heart happy. I'm sure you're wondering what is my least favorite and honestly I'm going to say nothing. I've learned so much this year. I am human. I have brain farts, bad picture days, typos, I take breaks and sometimes wonder if this is right for me. Don't we all? So here's to more typos, late nights, product reviews, giveaways, recipes, and MORE! I hope you all have an amazing New Year's and bring in 2015 with your loved ones.. I feel you on learning a lot with blogging- having typos, bad picture days, etc. It is amazing to look back and see how far we have come- I know when I look at posts from January of last year, they are so much different from what I will be posting this coming January! One of the greatest things about a blog is being able to look back on your life through your pictures and your writing. A blog is a living testament to the changes that you go through every day. I can hardly believe it's the last day of 2014. This past year flew by! Can't wait to read up on you adventures in 2015. Hope it is great to you! I too, have learned a lot with blogging in 2014! I cannot believe how fast time flies by and that it's almost a new year. I hope you and your family have a great New Year! Well 2014 ended on an almost bad note--my Mom was admitted to the hospital-she is 92-she had managed to get totally dehydrated!! The good news is she is back to her feisty self (well almost) and back in her apartment driving me crazy with she wants this and then that which means I have to drive over there--but better that then the alternative! This year went by so super fast! We did so much, but not enough at the same time! Congrats on the camera! I can't wait to get one for myself! Here's hoping for an even bigger 2015! Looks like you had a lovely Christmas! 2014 went by too quickly for me too, best wishes to 2015! Your kids our lucky to have mommy santa find their gifts for them. Christmas is really great with kids around. Happy Holidays! I love the idea of a Christmas Eve box. Usually my husband gets the kids Christmas pajamas way before Christmas, but still this is such a great tradition to start. Your Christmas sounds so wonderful, I'm glad your girls loved their gifts. I'm with you on practising photography, I got a Nikon D3200 for Christmas and I need to learn how to use it. I love looking back at my blog and seeing how far I've come - although some of it makes me cringe! Happy 2015, I hope you have a wonderful year. I would so have to agree the best by of Christmas is having children. Now that my boys are older and both over 18 I can't wait for grandchildren. I think all girls want a vanity. Great choice for her by the way. I love your choice from last year indeed. Thanks for sharing. Aww!!! Way too cute! 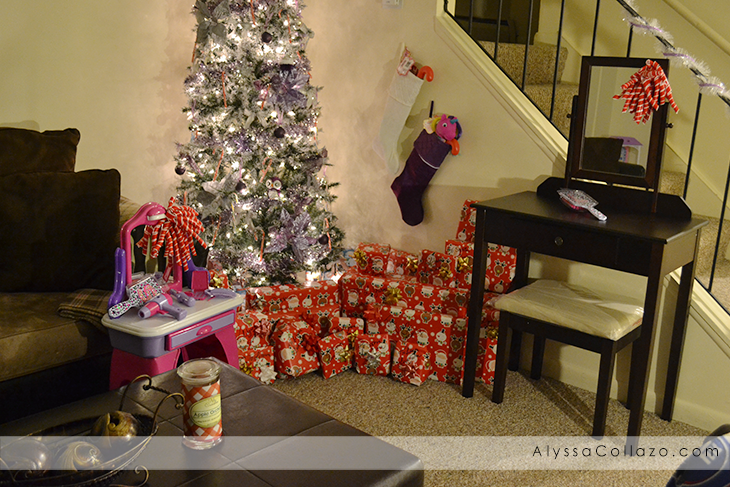 I love Christmas and love how excited my children get! Be blessed and many more amazing moments for you!